The Indian navy suffered yet another mishap on Friday with gas leakage in an under-construction warship in the Mazagaon Docks, claiming the life of a Commander and hospitalisation of two dockyard employees. In the 11th incident in seven months stalking naval assets, Commander Kuntal Wadhwa, 42, lost his life after he inhaled carbon dioxide that was leaking from a malfunctioning unit just a little after noon while undergoing trials in the Mazagon Dockyard Limited, officials said. Two employees of the defence ministry shipyard also were affected by the gas leakage and were taken to hospital, in the second mishap to involve the navy in nine days. An MDL official said they have been discharged. The Kolkata Class 'Yard-701' warship is yet to be commissioned and was slated to be inducted into operational service soon. The Navy and the shipyard have set up separate boards of inquiry into the incident. "Navy officer Kuntal Wadhva, 42, was declared dead before admission in St George Hospital at 1317 hours. He was a resident of Colaba and his relatives are coming from Thane," Additional CP Krishna Prakash. "Yard-701, being built by Mazagaon Docks Limited, while undergoing machinery trials in Mumbai Port Trust had a malfunction in its carbon dioxide unit, leading to gas leakage," an MDL spokesperson said. Prakash said that at about 1245 hours during fire fighting testing, the CO2 bottle neck opened accidentally, releasing the gas. Last week, INS Sindhuratna had met with a fire accident in which two officers lost their lives leading to the resignation of former Navy Chief Admiral DK Joshi. Prakash said the 6,500 tonne warship, the largest after an aircraft carrier and amphibious warfare vessels, was undergoing testing. It was to be commissioned on March 27. "Today at about 12.45 hrs fire fighting testing carbon dioxide released in hatch, bottle neck opened accidently and gas came out in this incident. Wadhva, Commander (Engineering), was declared dead before admission in St George Hospital at 13.17 hrs. He was a resident of Colaba and his relatives are coming from Thane. "Aslam Gafar Kazi, 51, worker of MDL, also suffered from suffocation and was admitted in Prince Ali Hospital Mazagaon in ICU," the police officer said. "He is able to give statement, we are now recording his statement. He is a resident of Noorani Masjid building at Bangur plot No 204 Pathanwadi, Malad(E). His relatives are coming to hospital," he said. 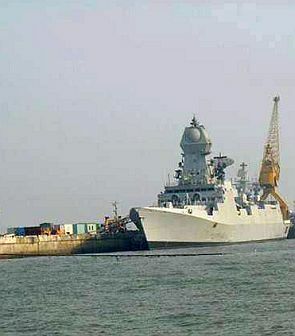 A Mazgaon Docks Limited spokesperson said the destroyer was among three similar ones being built at the shipyard located in south Mumbai. Trials on the ship have been underway for the last "many days" and during this time, the ship has been docked at multiple dcks within the city, including the Mumbai Port Trust and the Naval Dockyard. The spokesperson said that a particular system within the ship has been damaged in the incident and an assessment will have to be done. There was no explosion but the mishap occurred when trials on some machinery were going on, the spokesperson said adding the casualties happened because of inhaling bad substances. He said that the exact number of people working on the under construction vessel were not known immediately. The mishap took place just nine days after fire and smoke incident on INS Sindhuratna off the Mumbai coast, in which two officers lost their lives and seven sailors were taken ill.
Against the backdrop of the series of such mishaps, Finance Minister P Chidambaram on Thursday suggested that the Defence Ministry was not spending funds allocated to it "wisely" enough and that it should learn lessons from these incidents. The biggest mishap occurred when the INS Sindhurakshak sank inside the Mumbai harbour killing all 18 personnel on board on August 14. Earlier last month, INS Airavat, an amphibious warfare vessel, ran aground after which the commanding officer was stripped of his command duties. After the sinking of the INS Sindhurakshak, one of the mishaps involved INS Betwa which was damaged after probably hitting some underwater object. India's leading minesweeper, the INS Konkan that was undergoing repairs in Vizag, also caught fire and suffered major damage to its interiors. The Pondicherry-class minesweeper was getting a refit at a dry dock when the incident occurred. After the Sindhuratna incident on February 26, Navy Chief Admiral D K Joshi resigned taking "moral responsibility" over the spate of mishaps involving naval warships. 10 accidents in 7 months: Sinking Navy? Who will be India's next Naval Chief?